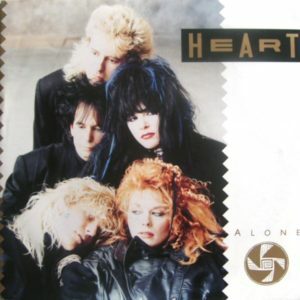 Allow me to explain how Heart’s 80’s power-ballad “Alone” is the best possible illustration of why this project is such a positive endeavor for me. Heart is the combination of Ann and Nancy Wilson, and their first two LPs – Dreamboat Annie and Little Queen – are solid gold in my book. Yet, in the early 80s the group faltered with two poorly-received albums, and seemed to be headed for a fade out. Then they released their biggest hit to date – 1985’s self-titled Heart, and followed it up with the strong Bad Animals in 1987. What changed? A quick look at the liner notes will tell you. The two lesser successes were written entirely by the Wilsons. The two hits include more outside co-writers, and some songs not written by the band. Case and point: “Alone” is Heart’s biggest hit, and it was written by Tom Kelly & Billy Steinberg – the major songwriting guns responsible for “Like a Virgin,” “True Colors,” “So Emotional,” and “Eternal Flame,” among other hits. (Today’s video features special guest-star E, who can be heard elsewhere as the lead singer of Filmstar, because I could not bear to play this song sans its signature harmony. You can see us both play as Filmstar on Thursday night at North Star Bar around 9:45p, or for free on October 15 at Fergies @ 10pm). The Peter of 1998 would have told you that Heart totally sold out by taking on the Steinberg/Kelly tune, and that they should have been happy to fade into the background on the strength of their own material. The Peter of 2011 thinks 1998 Peter should practice holding a guitar pick correctly, and maybe eat a sandwich. Few songwriters are an island. I’m hard-pressed to name a solo writer – or even a band – that hasn’t had their fallow periods. Billy Joel comes to mind, and he quit when he was ahead. Radiohead would have fit the bill but for this year’s clunker. My point being, there is no shame in being both a songwriter and an interpreter. A well-rounded artist should be both. It’s impossible to be all things to all people, and sometimes you need the talents of others to help you shine. That’s why you’re hearing a month of covers instead of a month of originals. Trust me, I have 30 originals you’ve never heard before and then some. But I decided it was time to explore how some of my favorite songs fit with my voice, and to hopefully learn something about myself along the way. Heart would go on to release Brigade, which featured even bigger hired guns, like “Mutt” Lange and Diane Warrne and only four songs co-written by the band. Afterwards they faded into semi-obscurity. Clearly you can take a good thing too far. I promise the covers won’t overstay their welcome.